Today’s recipe is from one of my favourite cookbooks. For me quiche Lorraine is one of those timeless classics and makes a great dinner recipe. I love this recipe from TV chef and cookbook author Rachel Khoo. Rachel’s recipe is really simple to prepare and uses just a handful of ingredients. 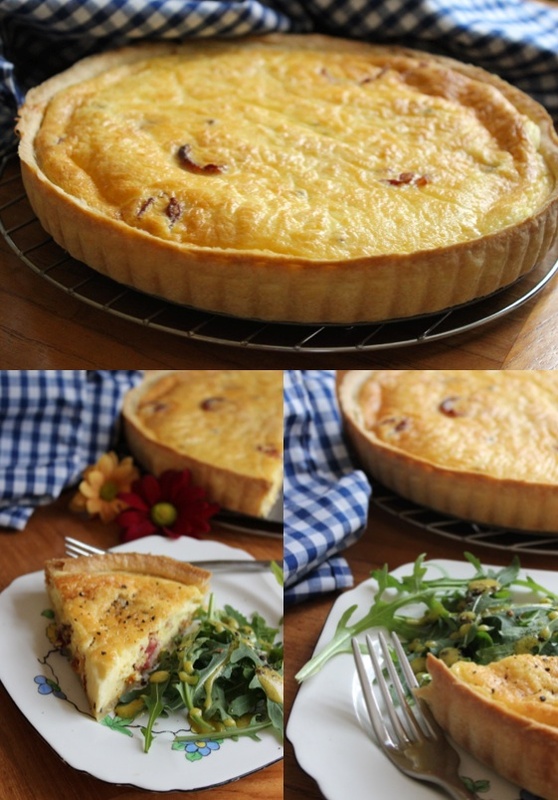 I love serving the quiche with some fresh, crunchy salad which has been mixed together with dijon vinaigrette. 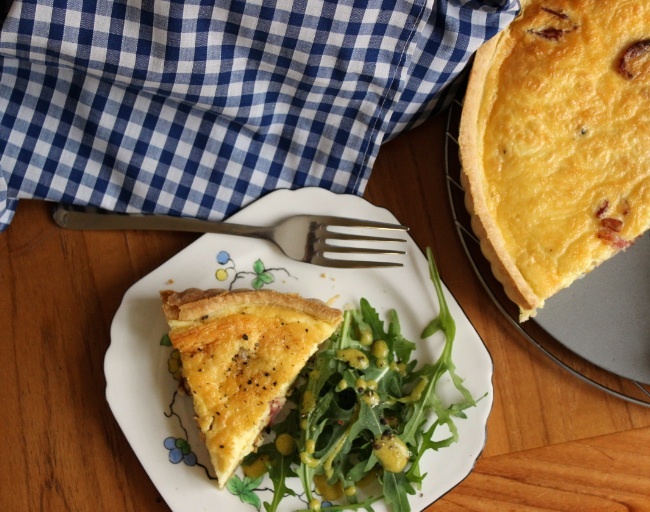 If you want to master perfect shortcrust pastry and the perfect quiche lorraine then you need to try this recipe! 1. To make the pastry: Start by creaming the butter, sugar and salt together until light and just combined. Add flour, egg yolks and the ice cold water and combine together using a spoon. Wrap the dough in cling film and chill in the fridge for at least an hour or overnight if you can. Take out of fridge half an hour before you want to use it – this will make it easier to roll! Roll the pastry out to fit a 23cm fluted tart/quiche tin and gently press into the tin. Then trim away any excess pastry, brush the base with some egg white and chill in the fridge whilst you make the filling. 2. To make the filling: Fry the bacon in a frying pan or bake until crispy in the oven. Scatter evenly in the pastry case. Whisk together the eggs, egg yolks, cream and season with salt and pepper. Pour the mixture into the pastry case and bake at 170 degrees Fan/190°C/375°F/Gas Mark 4 for 40-45 minutes or until golden on top. 3.Serve the quiche hot or cold. It’s really enjoyable served with a dressed salad. I heart quiches! They are easy (especially when you use a ready made crust :)) and fulfilling. I don’t eat bacon so I won’t get to try the quiche Lorraine, however I will definitely refer to this recipe in the future (I’ll just replace the bacon with something else:) ). Looks great! Hi Dani! You really should give the recipe a go, you could replace the bacon with roasted veggies! 🙂 really happy you like the recipe! I love quiche but have not made one in a while, your pictures are beautiful and really make me want to make one! Looks stunning, Jess! Love the filling – I can imagine how decadent this is. Just lovely. Muchas gracias Rosa! Really happy you like the recipe and thank you again for the kind comments! Really happy you like the photos too! This looks very yummy and easy! Will give it a try! It’s no wonder this dish has become a classic and your version is absolutely wonderful. Wow! These came out lovely! We did this for our mom for mother’s day and she was thrilled! I know what I’m having for Saturday breakfast! Quiche is my favorite and this Lorraine looks delicious! I could be able to eat half of a quiche lorraine by myself, I’m Not kidding. Your quiche looks so yummy, you were lucky I wasn’t there! That is one gorgeous quiche! Your Quiche Lorraine is beautiful. I like to serve mine with a crunchy salad too. I’d love to give the pastry recipe a go…it looks perfect! Looks perfect! I so love a good quiche…they are perfect for breakfast, lunch, or dinner! This looks like the perfect thing to eat for brunch on a lazy weekend. My husband and I love quiche (he even ASKS for me to make it! ), so we’ll have to try this soon! Yum! Might just have to make this for Easter brunch! Love me a good quiche… and this looks amazing! I’ve always loved quiche, Jessica, but had varying results with getting the pastry case to not be soggy! Since I’ve been par-baking things seem to have gone a bit better. Did you par-bake your case? Hi Helen 🙂 I followed Rachel Khoo’s recipe and it didn’t say to par-bake the pastry- but you roll it so thin, that it cooks completely and doesn’t have a soggy bottom! 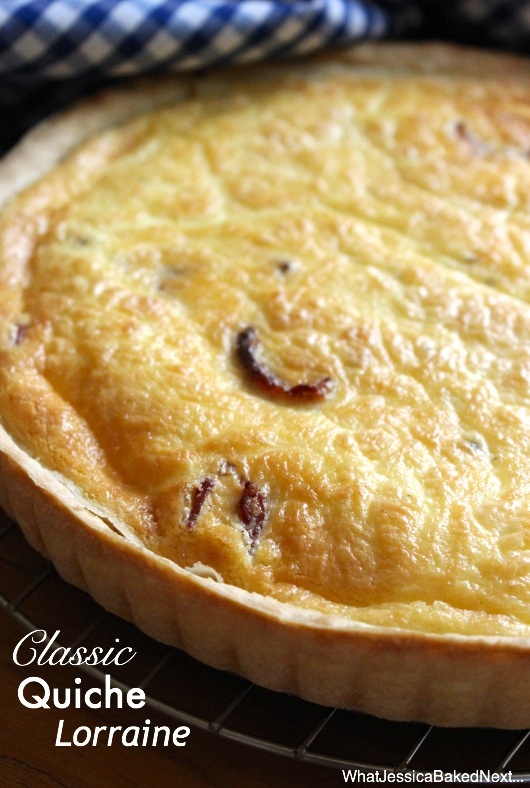 I Love quiche lorraine, and your beautiful classic recipe is fantastic. I have never seen this recipe but I must try it, Your quiche is gorgeous! Oh Jess this quiche lorraine sounds so yummy! I love quiche so much and I love your photos for this; the crust looks nice and firm and the quiche looks so thick! Perfect for brunch. Every since being in Paris, I love quiche all the time! Sounds amazing and delicious! I make quiche but it never looks this beautiful. Maybe it’s the double cream! I am going to try your recipe next time. I can tell it’s amazing. Russell has made this a few times as well and it’s always turned out perfect and absolutely delicious! Wooow your quiche looks soo divine jess! Soo beautifully done. What perfect slices! Looks so appetizing! Oh my yumm…I would love to have a slice Jessica :). 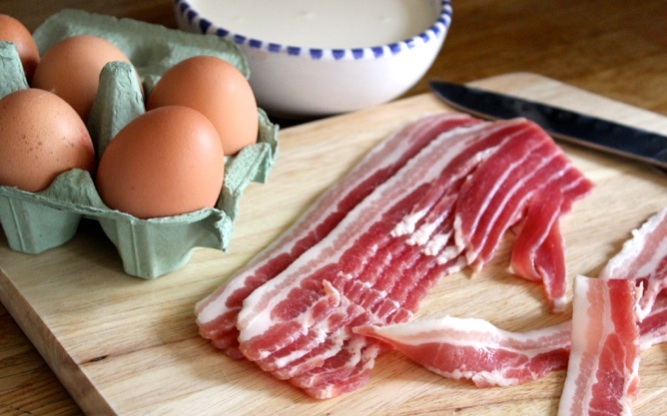 What are the other filling options besides pancetta? Any veg options? Can spinach and mushroom be added? This has me missing France like whoa. Will have to try that pastry! Hi, Rachel Khoo’s recipe does require two egg yolks to be added to the pastry. Adding yolks brings richness and creates a flakier and more tender pastry.